I stumbled into the office to laughter, hidden behind a load of boxes that had been delivered. I must have looked ridiculous but I didn’t care, I was excited. 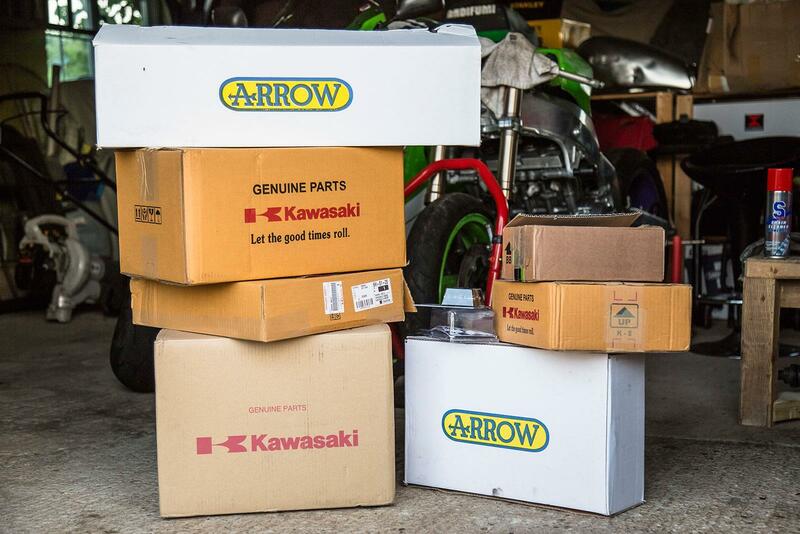 The contents of said boxes were a load of accessories for my Ninja 650. With parts to make the bike perform and look better, solve problems I’ve encountered and make it more practical. I wanted to tidy up the back end on the Ninja, so joining the R&G tail tidy (£79.99) I’d already fitted was a set of R&G pillion footrest blanking plates (£40.99) and a seat cowl from Kawasaki (£157.95). They’re simple additions but will really transform the profile of the bike. I’ve also got some replacement R&G cotton reels (£20.50) after the right-hand bobbin melted when I used the bike at Spa Francorchamps the other week. Another problem I wanted to overcome was fitting luggage to the rear of the bike. In its standard trim, the only place you can properly attach anything is to the pillion footrest hangers, which have a couple of hooks. The thing is, they don’t allow me to securely tie luggage down and whenever I’ve tried previously, I would find that my luggage would be pulled down the seat and wobble pretty badly meaning I’ve avoided trying to attach anything on trips. Plus, the footrest blanking plates will mean that there will be nowhere at all to strap anything now. To solve this, I’ve got a Kawasaki luggage system (£360.90) to fit. The peanut-sized 14 litre saddlebags don’t look like they’ll hold too much and they’re not exactly secure either, with no way at all to lock them or even fit luggage padlocks. But at least with the luggage rack I’ll also be able to also attach my roll-bag that houses my tent and sleeping kit, just in time for some camping trips this summer. The saddlebags will at least also allow me to take a few extra essentials as well, though I’d have expected them to be a little larger and more secure considering the price. Improving the performance will be an Arrow exhaust system. It’s not going to be the cheapest modification to make to the bike, but I’m really interested in seeing just how much you can get from the 650 and if it’s worth replacing the standard system. I’d also like to see if the new exhaust will point the gasses away from the Paddock bobbins to avoid it melting when I take to the track again next month. Next steps now will be to get it all fitted. The bike is also overdue its 4,000-mile service now as well so I’m heading over to Chris Walker’s Kawasaki dealership this week to get the work carried out. While I’m there I’ll also be putting the bike on his dyno to see just how much it’s making in standard trim and how much the gains will be with the Arrow system fitted.